Dang 2018! Where did you go?! Another year has flown by....it's hard to believe that it's been a full two years since living tiny! Some days I wake up and feel like it was just a week ago that I could reach up and touch that beautiful reclaimed ceiling. Do we miss the Pod? Heck yes! Do we regret moving on, starting a new chapter? Not in the least. Change is growth. And if you're not growing, then you're stagnant and dying. I've placed a great deal of focus on that concept this past year. With every moment, life presents us with the choice to either learn and grow from our experiences, or to deny and decay. Back in 2012, I was feeling quite stagnant. I did feel as though my spirit were rotting. It was infiltrating all parts of my being and had become unbearable, suffocating, heart crushing. I desperately wanted more from my life...more from myself. I wanted change and I wanted to grow as a person. The tiny house movement was my answer. All of my top concerns and passions seemed to roll neatly into this way of living. We could have our own home, we could build it ourselves, we could afford a project of this size.We didn't have to wait for land, we could get our finances under control, we could live well below our means and still in harmony with the environment at the same time. I remember desinging the framing of our tiny house on graph paper. The pencil shaking in my hand as I thought to myself, "Is this really happening? Am I doing this?!" And in each of those moments of intense emotion and self-doubt, a strong voice would come through, reminding me why I wanted this change to begin with. And through every new challenge, and every triumph that followed, that voice grew stronger and stronger. Some would call that voice self-efficacy. It is your belief in your ability to succeed in specific situations or accomplish a task. Speaking to a crowd about our tiny house adventure! Our tiny house experience launched me into a incredible trajectory of self-empowerment, self-growth, and ever higher ambitions. Every major accomplishment from this point foward, I owe in part, if not entirely, to the tiny life adventure. It has taught me to be bold, to believe in myself, and to look nowhere else but within, when seeking answers to what I should do next with my life. I'm excited to share that, later this week, I will be doing a podcast with my good friend, Ethan Waldman, of Tiny House Engage, and we will be touching upon this very concept. More specifically, we will be chatting about how the tiny life often leads to entrepreneurship, and what that has meant for me. Go check out his page for updates on when the podcast will be posted! And now, here's a slew of pictures from the tiny house events we enjoyed in 2018! We may not be living the life (right now), but we are still very much in love with the community and the way of life we created for ourselves during that time. First night at THSC6 around the fire.. The "Women of Tiny" fundraiser event for the Fuller Craft Museum was a lot of fun. As one of the badass women of tiny, I had a great time speaking to an eager crowd, sharing our best bits of wisdom, and reminiscing about the journey. As always, Deek of relaxshacks.com put on a great event, chalk full of education, demos, and hands on projects for all levels to learn. Our great little shelter for THSC6, built by campers in previous years! 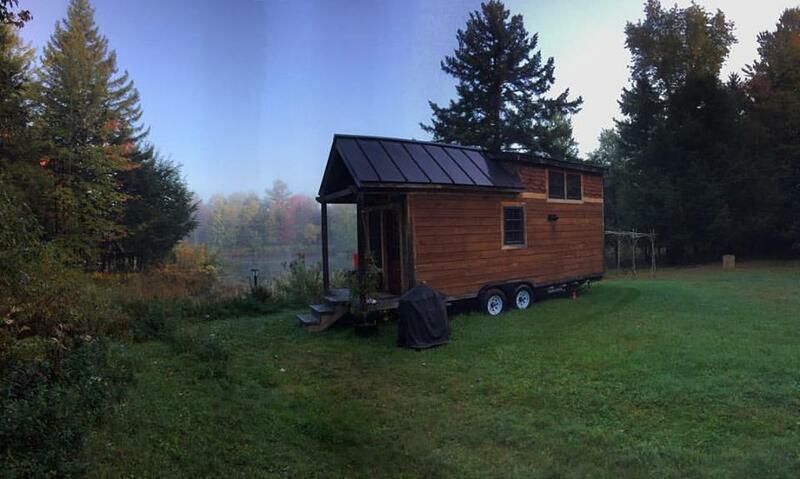 Later in the fall, we headed out to our fourth year at Tiny House Summer Camp in the woods of Vermont. This has become one of our traditions that we truly look forward to every year. Not only do we get to spend time with our favorite tiny house friends, we get to meet new people with a fresh dose of zeal for living tiny. It always ends up breathing more passion into what Dan and I share with these great campers, and each year we leave with a renewed sense of just how awesome this journy has been for us. This past year, I got sick while at camp, so I was a bit bummed that I wasn't my best self, and wasn't able to pitch in as much. We still enjoyed morning forage walks, songs by the campfire at night, and yet again, some crazy fun random things too, like making a forge on site and melting beer cans to make bottle openers. Yep, Matt Gabriel, The Animal Man Survivor, put on quite a firey show at THSC 6! I recommend you come check it out this year! It was the year of fire! 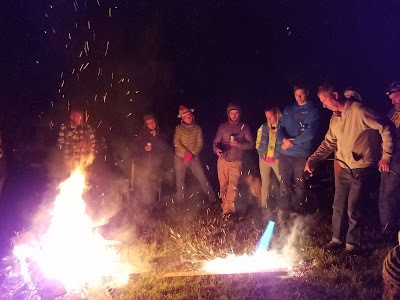 Between flaming arrows, forges, and Palo's blow torches, THSC6 was full of excitement! 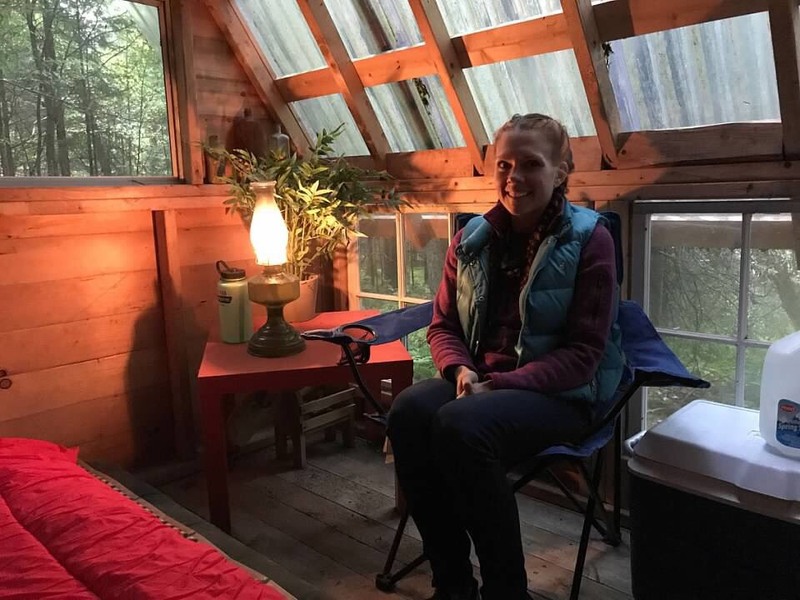 Just a few weeks later, we went to check out the 4th Annual BIG Massachusetts Tiny House Festival, run by the amazingly accomplished Miranda Aisling Hynes. It was a great event, and we had lots of fun seeing many of our tiny house friends yet again! It was so much fun to walk around, checking out more than 10 different tinies, a slew of schoolies, and live music, local food, and many different presentations throughout the three day gathering. If you live in New England, it's an event worth checking out this year! The schoolies section was so cool! The Box Truck was hoppin the whole time! Our favorite was the Fire House tiny house! The Box Truck at Tiny House Summer Camp! It's been a year since my last post, and I'm sure many of you are wondering- what the heck you been up to!? Well- living life! And, once again, quite a bit of change has happened in 365 days. The last time I posted, we were 3 months into living without the Pod. We were staying at a family member's apartment, a perfect little transition place, as they too, embrace small space and minimal possessions. We have since found ourselves an apartment, which is a bit too big for us- HA! But then again, we would say that about most any place we found. Our place is a two bedroom on the top floor with lots of natural light. Perhaps the most important detail: it's minutes away from where I did all my baking. Let me tell you, when you spend all night baking alone, and you finish cleaning up at 1 am- knowing the drive home is only 5 minutes instead of 40- that's a game changer. The near empty room- we could fit 1.5 Pods in here!! We told ourselves that we would NOT fall back into that strange need to fill a space with stuff. As a result, we have a whole room that is nearly empty. It's actually our "home gym" room. Just two small shelves, a plant, a chair, and mats on the floor. And you can bet your bottom that I went second-hand, side-of-the-road, and reclaimed all the way when it came to the furnishing. It was strange to move into a place and not have a single stick of furniture! All of our seats, tables, and shelves in the Pod were built right in! So they rolled away with the rest of the tiny house. Our chairs may not match, there are scrawled messages in the bottoms of our dresser drawers, and our kitchen table may have a few crayon marks from a kid we will never know, but I love every bit of it. I love that we are not contributing to the demand for "fast, cheap, new, NEW, NEW!!" I can certainly appreciate a beautifully decorated room with accent pillows and sleek chairs, colors and patterns popping as you enter the space, but when I think about what I care about the most, it certainly isn't matching pillows and paints. It's so easy to get swept up these days, remember to come back around to your OWN values. "Too many people buy things they don't need, with money they don't have, to impress people they don't know." So what's been going on in our lives? Not much related to tiny houses, hence the lack of posts- well that's half of the reason. I told myself a long time ago that I only want to contribute genuine and original content. So unless I have something new and original to share, I'll let the rest of the internet do the talking. I'm certainly happy that tiny houses have become a common place idea. 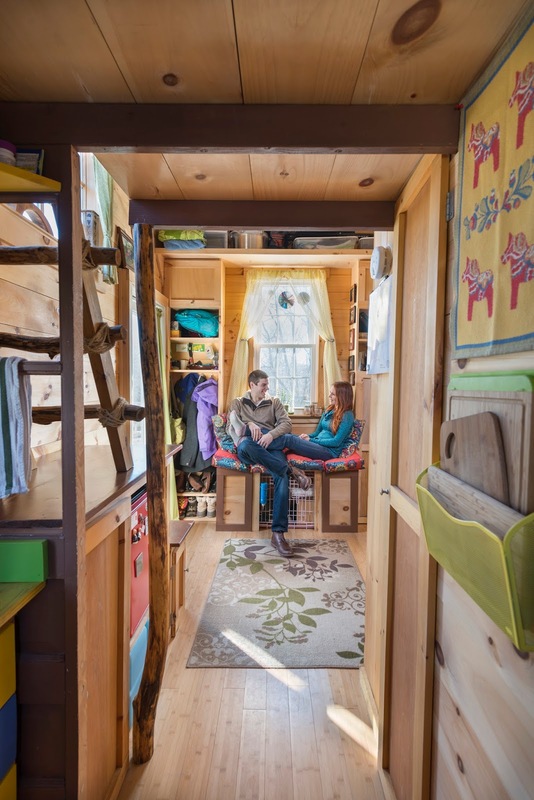 It's nice to mention the words "tiny house" and hear three or four people perk up and share what they know versus the sea of blank faces that Dan and I were used to. Although, I have to say, it is a bit of a bummer to see the DIY aspect subside and give way to big companies. What's the other half? My baked goods business took off in a big way in 2017. Too big, as it turns out. I had no time for anything or anyone else in my life, let alone keeping up with blog posts. It was a difficult realization, but I decided to close the business at the end of the year. I worked my little buns off, carrying out every single aspect of the business myself, and 90% of the time, I was completely alone. I started to burn out, and when the money started rolling in, but did nothing to lift my spirits, I knew I had my answer. The baker's life just wasn't for me. I barely saw my husband, let alone my family and friends. I missed out on so so many things, and why? So I could kill myself making muffins for strangers? In the long run, I realized that I love making food, and feeding people, but I don't want to do it for the masses....every...single...day. So I'm changing directions again! And I'm learning to go easy on myself, to be okay with that. I never would have known how I felt about being a baker unless I tried! And life changes constantly, so why can't we? The tiny house adventure gave me this zeal for just going after my passions...all of them. The environment, food, and fitness seem to be my reigning interests, and now, I'm about to see what happens as I dive into the third- fitness. I am currently working towards earning my certifications as a personal trainer! I believe I will find the flexibility and balance I am looking for with this new venture. I will have more control over my schedule, I will be able to travel, and hopefully dip my toes back into tiny life, even if I'm just renting a cool little place for a weekend. Archery at THSC 5! Awesome! Anyways, despite the crazy schedule, Dan and I still did a few tiny house related things in 2017. We attended Tiny House Summer Camp in the sticks of VT. It was our third year in a row! And WOW! That summer camp is getting crazy! There were multiple tiny houses, so many awesome activities, 3+ builds going on, demonstrations, and a bunch of cool presenters. One in particular, Zane, is a video blogger, talented photographer, and more. Plus, he's just an all around amazing and worldly dude. He brought a bunch of tech with him and got some insane shots of the activities going on using his cameras and his little camera drone. Check out his videos of 2017 Tiny House Summer Camp and follow his other adventures. Dan and I LOVE this guy. :) THSC Part 1 video ... THSC Part 2 video... THSC Part 3 video.. This gypsy wagon style tiny was SWEET! Many of the structures are also available for rent while attending the camp. We stayed in the Robot tree house and it was EPIC. Such cool views, and the most inviting morning sunlight I have ever witnessed. If you haven't checked this event out yet- DO IT. Several tiny houses, vardos, wagons! Archery! Survival and foraging classes! Solar oven cooking demonstrations! Multiple builds at different stages to learn different skills! Speakers and more! I can only imagine the sheer awesomeness of this years camp! A couple months after that-- I also helped out our pals, Alex and Deek, with the Box Truck! They were invited to the Green Build Expo in Boston, and I helped man the booth....or the box truck I should say. Alex drove the truck right into the convention center's gigantic main floor. Not only was it a LOT of fun to see so many different green initiative builds, products, organizations, and services, it was great to see people react to the truck. As I have mentioned before, Dan and I have been a peripheral part of this project from the beginning. We donated funds, we told everyone we knew, we invited Alex and Deek to take a look at our place for reuse inspiration, and to film some clips for the documentary. So to finally see it complete and wowing one person after another was priceless. I even snagged a little nap in the very cozy bed nook. Gigantic windmill that's also solar! 2017 was a busy first year out of the Pod for sure! But we still managed to stay involved in a couple cool tiny house events. I hope to bring more aspects of our tiny living experience back into the fold this year. I am definitely and project person, and I have a few ideas swirling around my noggin that I would love to make a reality this year. Time will tell! But one for sure project in 2018: I will be speaking at a great fundraising event! 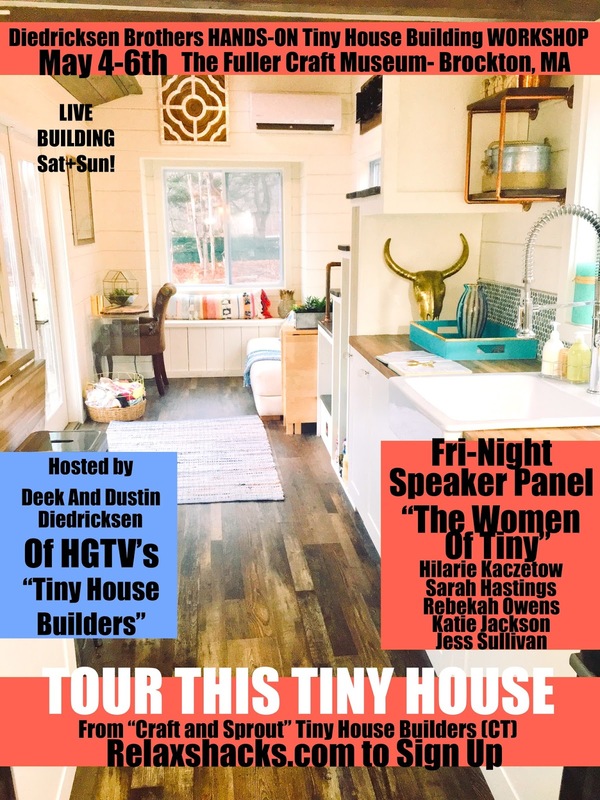 "The Women of The Tiny House Scene" is a great event in support of the Fuller Craft Museuem. This place is very cool, with some of the most eclectic displays I have ever had the pleasure of taking in. Dan and I also helped our buddy Deek at a workshop he held in the museum last year! 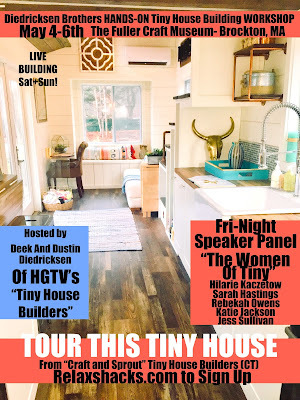 A handful of badass ladies from the tiny house scene (myself included) will be presenting on a number of different topics this Friday evening at the Fuller Craft Museum in Brockton, MA! Come on by and say hello to some seriously inspiring people, help raise some money, oogle some art, and then stick around and learn to build tiny structures through the weekend! It has now been about three months since we have lived in the Pod. I think that's a pretty solid amount of time to adjust back to more conventional ways of living. I have been incredibly curious and observant of the both of us as we have transitioned. I wanted to know what habits and mindsets would stick with us and what would fade away. One thing I spoke about in length at the very beginning of this journey was the true desire to simply have the experience. No matter what came of it, how long it went on, or even if it didn't totally work out, (but it SOOOO did) we wanted to give it a try and live through what followed. I've said it before, and I'll say it again: gathering experience is what makes life grand. We will all grow older, but if we seek experience over stuff, we grow deeper and richer as individuals. 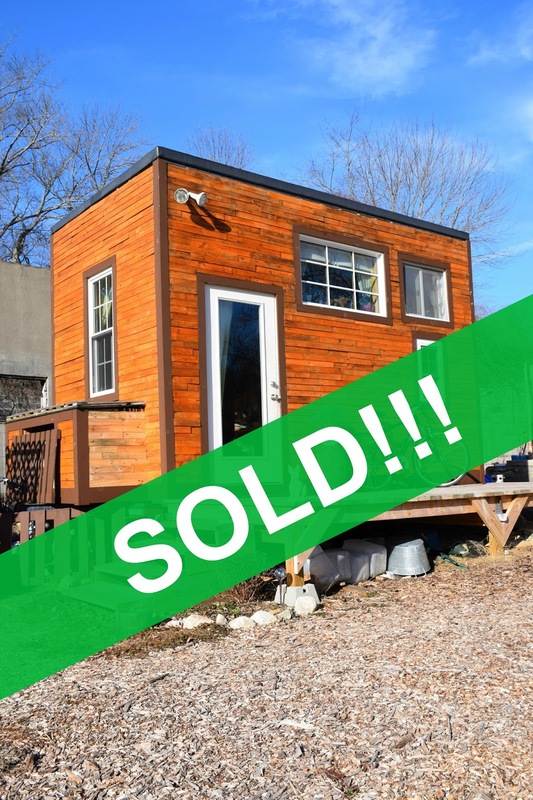 I have heard so many different people remark, "Well I guess living tiny doesn't work," when they hear of someone selling their tiny house and moving on. We were still living in the Pod when I came across that mentality for the first time. The person was commenting on another couple that was leaving the tiny life behind after about three years. I immediately thought, "What an idiotic, narrow response!" By that logic, we really need to rethink apartment living, because those people relocate as often as every year! I guess apartment living doesn't work! -- Oh she had that hair cut for two years, now she's changed it? Guess having hair doesn't work! Shave it off! ......I think you get my drift. No version of Jess saw this coming! This person was turning a gigantic blind eye to...let's call it LIFE in general. I think back in five year increments and who I was at 25, NEVER EVER would have seen all the experiences and accomplishments that 30 year old me was bringing. The same goes for 20 year old Jess trying to imagine what 25 year old Jess would be. The point is, the "Decisions Made for Life" list is very short- heck! Even tattoos used to be on the list and now, (with enough money and sessions) those decisions can be reversed too. So to say- at any age really- "Yep! This is it! This is where I want to be for the next 50 years, I won't ever feel differently about this! No sir!" - is just plain ridiculous. I digress. Back to the sociology study- so here is what I have noticed about how we live life now... We are incredibly lucky to be able to stay in a family members' apartment while they winter in Florida. They too, started to recognize the benefits and beauty of minimizing. So we got to transition back to regular spaces with perhaps the most perfect place! Dan's side of the closet is bigger!! The apartment is maybe 600 square feet with an open concept. They have just enough dishes, towels, chairs, etc for two people. There aren't stacks of books or shelves full of picture frames. We didn't find 34 different bottles of lotions, peels, scrubs and soaps in the bathroom. It seemed almost hotel-like at first, but the space has a very clean and inviting energy. We only moved in our clothes, computers plus gadgets, and some choice pantry items and kitchen tools. We were incredulous when we saw that we had cluttered up certain areas. We might have lived tiny, but that doesn't automatically make you a minimalist. I found myself overwhelmed with the urge to donate even more things. Major discovery number one: My involuntary need to get things just to fill a space, has been eradicated. Huzzah! I look at the simple layout of the kitchen slash living area, and feel no urge to put a big vase in that corner and a little statue on a stool over there, and a bowl of ceramic fruits on the coffee table. Major discovery number two: This one actually came on the heels of the first- my ability to let items go is approaching Jedi Master levels. It was something I really had to work on when we began the journey, and had to keep in constant awareness as we lived in the Pod. But now, suddenly, I am a pro. My theory is that, since my ties to items were often sentimental, and we just let go of our tiny house, our veritable baby -- well....haha, giving away that pair of shoes is nothing now. I have learned that very little of life's material things are really worth the effort it takes to carry them along through all that life will bring...and minimizing is cathartic and energizing. Major discovery number three: My obsession with water use has some how intensified. I am painfully aware of every time I use water, but it's also a little magical too. Knowing I didn't have to carry that water into the apartment is pretty awesome. I am so happy that something as simple as running water is now a source of joy. It should be. This enduring appreciation for water, and keen awareness of my usage, is something that took root thanks to our way of life over the last three years. Major discovery number four: The friendships and community we have gained through living tiny will always be there. We have a pretty sweet group of friends, all impressive and compelling individuals that we are proud to know, let alone know well. We have continued to participate in cool tiny house stuff. If you missed it, check out the podcast interview we did with Tiny House Podcast! We met Michelle at Deek's tiny house summer camp last fall! (Relaxshacks.com) It's a more candid conversation that sheds light on our backgrounds and the underlying motivations and desires that took us down the tiny path. We also recently joined in for one of Ethan Waldman's Tiny House Engage sessions focused on building with salvage and re-claimed materials. It's a great group on FB that is committed to sharing quality information on tiny houses. Major discovery number five: The size of my cooking messes will always be directly proportionate to the size of the kitchen I use....as in, I will fill it all with mess. Ha! I am truly enjoying having a fully-applianced kitchen once again. I did miss that while we lived tiny, but now, I have a reason to especially enjoy that oven, that large deep sink, all that counter space! And much more so than I did before we had those experiences. In short, I believe that those three years of living tiny "worked" fabulously. The fact that it lasted for three years and not eternity certainly doesn't make it a fail in my eyes. Not only did we save a bunch of money and pay down a good amount of debt, I actually started my own business! I went down this path wanting to be more aware and appreciative of the small things in every day life. I craved the empowerment that comes with building your own home, and wondered what all that new found courage and confidence would spur next in life. Let me tell you, the adventure did not disappoint. We are so proud and grateful to have experienced living tiny. Peas Without Their Pod: What's Next For Us? I let myself have the month of January to allow everything sink in. Even now, as I sit in our temporary apartment, enjoying tea made from "faucet water" and unlimited electricity, I still somehow feel like we haven't left the Pod. As if we are just house sitting for another weekend, and soon enough we will drive back up to the farm, turn the corner up our old driveway, and there she will be, waiting for us. What that tells me is that I really truly, deeply, and irrevocably adored that home and way of life. I don't remember feeling this way about any home I have ever lived in, and I have moved a lot in my life. I didn't struggle nearly as much even when the traditional home I once owned and slaved over was wrenched from me, as the relationship I was in crumbled. This time around, it was a conscious choice. We were ready to sell the Pod, at least as ready as you can be. We knew our next step and our next chapter would only happen if we parted ways with our beloved abode. On December 30th, I managed to muster a short post, documenting a huge moment: the Pod leaving Rhode Island. It was a quiet moment, no parades or parties. The tiny house that had sat still, kept us safe and warm, and cultivated and curated some of our best characteristics as individuals and as a couple....just quietly rolled away, leaving hardly a mark in it's place. The lasting marks were not made on the ground; that little place has left an indelible mark on our souls. We knew we had to put together some kind of video, and we wanted it to reach a lot of people, so we chatted with our good friend Deek of relaxshacks.com about making a sale video. This was mid summer. Schedules got crazy, lines of communication went silent. I worried a bit...ok, A LOT. Us with Alex- the reuse guy! 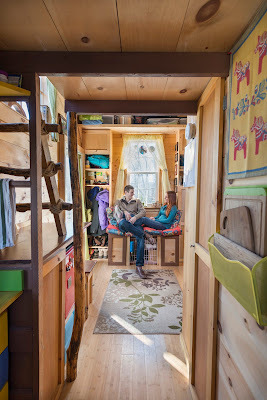 It so happens that we also had agreed to be in a really cool documentary about converting a box truck into a tiny house using completely reused materials. (Check it out: www.boxtruckfilm.com ) This project is being carried out by the reuse king: Alex Eaves of stayvocal.com and the mini-build master: Deek! Dates for this kept getting shuffled, until finally a day in early November seemed to work for the hectic schedules of all three parties. Deek getting some cool shots for the sale video..
We spent the afternoon filming interviews and shots of the Pod for the documentary. As the afternoon sun began to wane, the filming wrapped up. Deek had brought his own camera stuff, as we hoped to squeeze in a shoot for the sale video. With about 20 minutes left, we hammered it out. Within a week, Deek had the video up online, and about 5 days after, we had put up posts sharing the official news. Dan and I were both sweating bullets. This was it- we were about to get some real, raw feedback on our house. Would anyone want it? Would anyone else think it was as beautiful and wonderful as we did? Would anyone think our price was reasonable, or ridiculous? Would anyone contact us AT ALL? I didn't really want to know at first, so I was thankful that we were slated to go visit family on the West coast for Thanksgiving. I desperately wanted distraction during that time....but wouldn't you know? None of that worrying was necessary. After Deek posted his video, Sarah contacted us THE NEXT DAY. We chatted a bit, and I answered a few of her questions, which spurred me to write a post answering many of the common questions we were getting in an avalanche of emails. We planned a day for Sarah to come see the Pod once we returned, and I held off scheduling visits with anyone else until Sarah had already come by. After I wrote the post, Sarah emailed me again, expressing just how interested and motivated she was. It was a great feeling to kick off a week of nice weather! When we got back, Sarah came to see the place, and as we talked, I grew more and more excited. She mentioned that she loved our house from the very first video Deek posted from over a year ago, and had hoped that maybe someday we would sell it. She pointed out all the details that she knew of, really commending us on our efforts to recycle and reuse materials. She was happy that we had it set up as off grid. She really liked that there was no plumbing, and she already had an outdoor shower on her FARM. She didn't want to worry about the winterizing process in the NH cold. So it was perfect for her. She loved the simplicity and the big feel of the great room. She loved that we chose pine for the walls and not sheet-rock. She loved the colors we chose and the Swedish inspired decor. A fellow Swede! Amazing! Then, as if we needed sprinkles on this already iced cake: she told us her vision for the Pod. She teaches classes on homesteading and sustainable agriculture right on her farm and plans to rent out the Pod for workshops and provide an "Artist In Residence" opportunity for college kids during the school year. She said we were welcome to come attend a workshop and come visit the Pod!! We returned home on a Monday, and the Pod was officially sold that Thursday, December 1st to perhaps the most perfect possible person. So within two weeks of sharing this with the world, our house was sold. Within 20 days of that, all the "paperwork" was done, and the Pod was rolling away. I had worried about so many different things, and the last of my worries was: how long will it take to wrap up the final details and move the Pod out of RI? I wondered if this would follow us into 2017. Nope! It all was so seamless and easy. Dan and I kept pinching ourselves. We would randomly blurt out to one another, "Is this really happening?! It's sold? It's done!? No tire kickers?! No low ballers?!" The universe seemed to say, "Don't you worry, Jess and Dan, you are doing the right thing. I've got it alllllll covered. I've got this person who happens to find every detail you are worried about- like the no plumbing- to be absolutely perfect. I'll have her contact you within 24 hours. She lives right in New England, she loves all the same things as you, she thinks your price is more than fair, and she will take wonderful care of the Pod. I'll have it all wrapped up before the year's end, so you have a fresh start in 2017. Now roll on to your next adventure!" Our new focus will be the business, Two Little Buns, but we will still be involved in the tiny house world. We plan to return to tiny one day, and we will live with it in mind until then. We still have a lot of fun things to post about...many plans to visit all the tiny house friends we have gained, and perhaps plans to build a tiny mobile "booth" for the bakery! The Pod Is For Sale! I had been hinting about big changes earlier in the year, and now we are confirming those decisions by putting the Pod up for sale. The choice to give up our wonderful little home of three years certainly was not an easy one. In perfect circumstances, we would have loved to have kept it, even if we decided to move into another place. There was a time when we imagined this would become a cool guest house, or art studio on our own piece of land. But, as I am sure you have all experienced, life rarely goes as planned. That is not always a bad thing either! When I think about all that has come our way because of this tiny house, I am overwhelmed into laughter. The friends we have made, all of which are simply incredible, inspiring people in their own right- and we get to say we know them. We get to call them up and congratulate them on wonderful accomplishments, have lively informative conversations on common passions...this has enriched our lives to a degree I never could have imagined. Then there is the long list of accomplishments that Dan and I can now draw upon for strength, courage, and perseverance in all of our future endeavors. The recognition and reputation we have earned as part of this community. I never thought I would be in a magazine, multiple newspapers, gigantic online presences like Yahoo, AND become a published author myself!! I can say I was once referred to as a "tiny house luminary"... oh lala! Haha! Perhaps the crowning achievement, however, has been to arrive at a much greater level of self confidence and a considerably healthier financial situation. This in turn gave me the guts to go after a long time dream, starting my own specialty foods business. I can say with absolute certainty that I would NOT be a full time business owner today, if we had not chosen to go tiny. All of it just makes us so damn happy! We knew the tiny house would be a temporary thing, we wanted that experience of building and living in a small space, and a chance to get our finances in a better place, full well knowing that we had many, many more chapters to write in our life together. We see now, that this chapter is coming to a close, and our new adventure is the baked goods business. We don't know where this thing will lead, but we are certain of a few things: we will return to tiny living when we retire, we will remain active members of the tiny house community, and we will be forever thankful for, and humbled by, the entire experience. Pictures: Please visit our blog and go to the professional photos tab to see some pictures taken in March of 2015. We have since stained the exterior. Video Tour: We just did a great little video tour with our good friend Deek Diedricksen of relaxshacks.com - watch the video here. Solar Power System included: No, but willing to to discuss selling that too. Dimensions: Interior 8 ft x 15.5 with 10 ft ceilings. Exterior 8.5 ft x 16ft x 12.5 ft high. Length does not include trailer tongue. Trailer details: Bought lightly used. Heavy duty dual axle 5 ton trailer. Has a brake lights system, unsure if it still works, may need some basic maintenance. House weight: Never weighed at a station, kept a spread sheet of materials and did the math, it weighs an estimated 6300 lbs. Road worthy: Yes, but not designed or built for constant towing. We did not use hurricane ties in the framing, we recommend not exceeding 55 mph tow speed. I believe it is a 2 and 15/16th hitch. We moved it from our build site to our current parking space with no issues. Shower/running water: No indoor shower or running water, we use a super basic outdoor shower stall and camp shower bag. We store water in water bricks which you can keep. And poor it into a water filter and pitchers for everyday uses. Hot water is heated on the stove top and used to wash dishes in a bin, or added to the shower bag for hot showers. The shower stall is very basic, not really worth taking with you, but you can if you want. Kitchen: We have an RV propane cook top (3 burners) in the kitchen. We have a water filter set up a little higher than the counter and the spigot serves as "running water" when we need to wash our hands, etc. Sink is a stainless steel bin set into the counter. Pops out easily to empty water into outdoor gray water beds. Heat: HomeComfort direct vent propane heater to heat the house, and also an electric eco-heater to serve as some additional zone heating if need be. We have never had to use the second heater and the propane heater has never been put above the second notch. It is plenty big enough to comfortably heat the space. It is designed for a 320 sq ft space. Bathroom: Super basic composting toilet, a 5 gallon bucket and a place to keep wood shavings. No urine diverter. Electrical: We installed our own electrical. I owned a home once before and performed all the electrical wiring, which met code and passed inspection. The Pod's wiring is very basic. We used basic 120 house wire. One wall of the house is a daisy chain of three outlets, the second wall has two outlets and the three lights: the kitchen, great room, and porch lights. Picture each wall as a big old powerstrip, because two wires come out of the house ending at a three prong plug. We did this so we could plug each one into our inverter. The inverter is equipped with a breaker, so we did not see the need for a breaker panel. A small breaker panel could be installed with ease, and the house could be hooked up to the grid. Insulation: We used foam board insulation in the walls and the roof. The walls have a hardboard insulation reclaimed from a building that held industrial food coolers, so it is a solid board of insulation that is 3.5 inches thick, and fits snugly into the 2x4s of the walls. This foam board is rated at about R-26. We also spray foamed each seam and nook and cranny in the walls, so it mimics a spray foam application, which probably bumps up the R-value a bit more too. The roof was built with 2x6s and contains one of the 3.5 inch insulation boards and an additional 2 inch blue insulation board, providing roughly 5.5 inches of insulation for the roof with total value of about R-35. We have lived through 3 New England winters just fine. We add a heavy curtain in front of the door to help with drafts during the cold weather too. Roof: Flat shed style roof with minimum pitch, just enough for water to shed. EPDM rubber roofing, one solid sheet, so no large seams across any part of the roof. No leaks and no ice problems in past three years. Storage: Ample storage, one large 9 sq ft closet, pantry shelves and storage spaces, and a small storage loft. Location: Rhode Island, must tow or ship yourself, we will not deliver. 45% + made from reclaimed and recycled materials. Completely unique design with high ceilings and an open area at the entrance of the house, giving it a much larger feel. Barn board ceiling from a barn raised in 1776. Pallet siding on 3 of the 4 sides, with eclectic array of wood species and great character. 4 ft loft allows for easy movement and comfortable sleeping. We strived to use the least amount of toxic materials as possible. We used tung oil on the pine walls instead of a stain or chemical seal. We used minimal paint, and skipped noxious nail glue in floors, so yes, there is a squeaky spot here and there. Still some minor finish details here and there, like little sections of floor trim. If we had kept it another summer, we would have extended the roof line on all sides by 6 inches, to give a better overhang and protect the siding. The door sticks a bit after rainy weather. An air exchange unit of some kind might be nice, we simply keep windows open or at the very least cracked at all times of the year. A ceiling fan would be a great summer addition, we used a series of fans, but to save on space, clutter, and energy, a ceiling fan would do much better. Well, I'm sure there might be something else you think of too, but I hope that gives a good look at what the Pod has to offer! We truly hope this place can become a wonderful home for someone else, and perhaps even provide them that stepping stone (or launching pad) to fulfilling other dreams! After a super fun weekend at Tiny House Summer Camp 4 - we had the treat of visiting Ethan and Ann's tiny house! Dan and I met Ethan back in May of 2015 at our first, and soon to be many, presentation as part of the Diedricksen brothers' hands on tiny house workshops. He had a great slide show of pictures, the lovely little home nestled in the Vermont hills. He was just beginning to put together his book, Tiny House Decisions, and since, has become a leading expert in many aspects of tiny living, especially cold climate preparation. At last year's summer camp, Ethan was generous enough to offer up a tour to any and all of the 40 odd people milling about- if they were willing to take an hour road trip to go see it. Dan and I almost went, but since we arrived late that year, we wanted to spend as much time helping out with projects as we could, so we stayed behind. We did however, become quite good friends with Ethan after a couple late nights passing whiskey bottles, strumming guitar, and singing what we could remember (and mumble bumbling through the rest) of some of our favorite classics. So this year, we made a point to spend some good quality time with Ethan, and his other half, Ann, who also attended the workshop for a day. It was great to finally meet Ann, and hear great stories of their wedding! They had just married the week before, right by their tiny, and they still came to summer camp! When Ethan invited us to come check out the place at the end of the weekend, we just had to go! We were in Vermont, and we simply couldn't pass up a second chance. The place is even more beautiful than the pictures can really show. They have the house parked right in front of a post card worthy scene- a small pond overlooking the blue mountain hills in the distance. I could get used to a view like that! It is always fun to explore another tiny. They are so varied and unique in their layouts. I always enjoy seeing how people choose to use their small spaces, and more often than not, it speaks to what the person is most passionate about. Ethan walked us around the property, showing us where the festivities took place, and the little buildings they had collected in preparation for the wedding. They had composting toilets for their event!! I love it! And they used one of Deek's buildings and another tiny building from Jamaica Cottage Shop, located right in VT.
We spent the last of the evening light relaxing on the picture perfect deck, the four of us chatting about living tiny, our favorite experiences so far, and the silly things we had in common as couples, ie: one being a great cook, and the other being hopeless in the kitchen. ;) We certainly didn't want to go, but the weekend was coming to a close, we had a solid drive ahead of us, and much work to be done with the business when we returned! We didn't take too many interior photos because wedding aftermath is no joke! haha But you can check out Ethan's book, and his site to learn more about how they built, and the special things he does to prepare for winter in a tiny house!